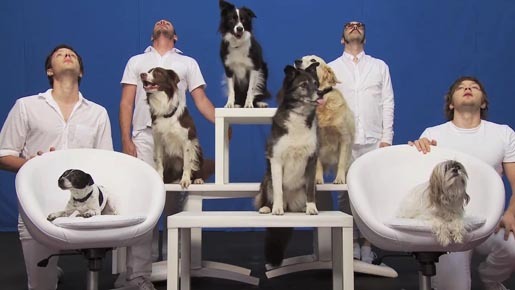 OK Go has come out with a new music video featuring choreographed dogs, premiered on the Ellen Degeneres Show. As most of the dogs in this video are rescues, OK Go decided to donate a portion of all proceeds from the sale of the video on their site to ASPCA animal rescue in the USA. White Knuckles music video was directed and choreographed by Trish Sie and OK Go and produced by Shirley Moyers,. The dogs were trained by Lauren Henry and Roland Sonnenburg and their team at Talented Animals, the town of Corvallis OR for being so welcoming to us.